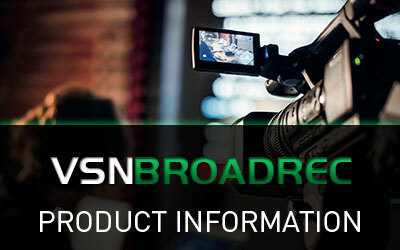 VSNBROADREC is a highly reliable multi-channel ingest server system that allows for continuous, uninterrupted, media recording of video or audio sources. It can perform continuous (24/7) or scheduled recordings from any source: analog or SDI (SD-HD signals), Transport Stream, etc. Depending on the source signal it can reach up to 15 CH per server in 2U. Contents generated by VSN’s media recording software can be used for re-broadcasting, internal use, internet publishing, Video on Demand (VOD), DVD media recording and archiving. Smart and cost effective tool for TV channels’ legal compliance media recording. It records all broadcasted contents to internal hard drives 24×7. The Media Recording Software works autonomously and can keep contents for as long as the national laws require, deleting the content once this threshold is reached. For internal use, program segments can exported to DVD directly from the application and also serves as proof for advertising auditing purposes, among other applications. VSNBROADREC integrates with different automatic content recognition technologies and with VSNEXPLORER MAM–BPM to offer innovative automatic content recognition solutions. Thanks to Audio Finger Print and Water Marking technology it is possible to build a detection platform for monitoring TV contents in real time, with applications for the auditing of advertising, copyright and electoral processes. ASR (Automatic Speech Recognition) is the technology that automatically transcribes speech to text. This allows for word detection and transcription of digital content and using this information for locating relevant content or segments. Perfect for TV and Radio auditing. User defined media recording quality which ranges from 256Kbps to 25Mbps in various output formats. Servers also capture the EPG and Close Captions of TV channels, allowing for performing searches on this metadata. It has indexing, cataloging, archiving and web publishing functionalities. The user application is web based and allows for accessing contents from anywhere with an Internet browser. Also, the media recording software allows for thumbnail based navigation for easy location of relevant segments. It includes a player to view the contents, export segments and add metadata. Broadcast Uses: TV legal Compliance. TV and radio channels monitoring. Advertising auditing. Government uses: Media authority. Electoral campaigns auditing. Recording of cour sessions. Recording of parliamentary sessions and Web publishing. 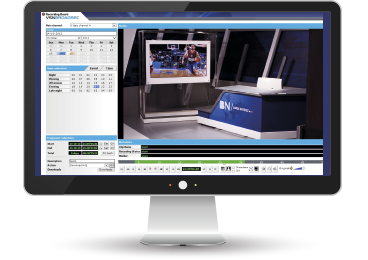 I was looking for a complete solution for a TV station, and I chose VSN because it covers everything that I need on a TV channel: it´s an End-to-End solution, from ingest or playout to news and MAM… and everything is working perfectly. VSN put a lot of energy in our project, and I hope that in the future we will develop many new projects together. 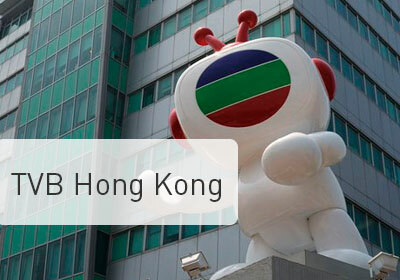 See this VSN's product in action in the TVB Hong Kong's case study.